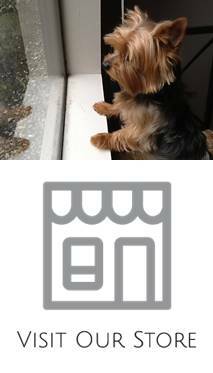 Home » Posts tagged with "yorkie history"
Yorkies are highly affectionate, outgoing, loving little dogs who are loyal, playful and amusing companions that quickly win our hearts and become our best friends. This energetic, brave and intelligent toy breed has a naturally inquisitive and courageous nature which makes them always eager for adventure and easy to train. It’s not surprising that the Yorkie ranks amongst the top three in terms of breed popularity because this petite, yet feisty little terrier is not only cute and adorable, but also highly intelligent, and overflowing with liveliness and an independently spirited personality that never quits. Although the Yorkshire Terrier breed has it’s origins in Scotland, it was named after the location where it was developed during the mid-19th century, by workers traveling north from Scotland in search of work in northern England. During the Industrial Revolution, Scottish workers traveled north looking for work in coal mines, and textile mills and factories, and settled in Yorkshire, England. They brought along a variety of small terriers, including the Clydesdale or Paisley Terrier who were much larger than the Yorkshire Terrier we know today. These dogs were crossed with other types of terriers, such as the English Black and Tan Toy Terrier, the Skye Terrier, and the small Waterside Terrier which had a long, blue-grey coat, and thus these mix of terriers became the fore bearers of the breed now recognized as the Yorkshire Terrier. Due to breeding for smaller size, today the Yorkshire Terrier is considered a toy or companion breed, and was first registered with the American Kennel Club (AKC) in 1936. Early on in its history the Yorkshire Terrier was used for rat baiting, which was a popular blood sport until the beginning of the 20th century when it was banned. Rat baiting involved putting rats in a pit and then placing bets on how long it would take for a terrier to kill them all. Although the United Kingdom implemented the Cruelty to Animals Act in 1835, this Act only prohibited the baiting of larger animals, such as the bear and the bull and therefore, ratting competitions became a very popular gambling sport, with rat pits in London numbering more than 70. Breeding of the Yorkshire Terrier was originally accomplished by the working Scottish people who brought these dogs with them when they travelled north seeking work in the textile industry, in the cotton or woolen mills or in coal mines located in the counties of Yorkshire and Lancashire, England. As relatively uneducated mill operators and workers, who were unaccustomed to keeping public records, were the originators of the Yorkshire Terrier breed, it’s easy to understand why breeding records were not kept during these early days and this also explains why breeding details are somewhat scarce. What does seem to be agreed upon is that the breed originated from a male Terrier named “Old Crab” and a female Terrier named “Kitty”. It is also understood that the Paisley Terrier, that has a long silky coat, and is a smaller version of the Skye Terrier, was also part of the mix that created the early Yorkshire Terrier. As well, some authorities say that the Maltese was also part of the DNA pool that originally established this breed. Whatever the exact story, today’s Yorkshire Terriers were all originally bred from Scotch Terriers from Scotland and shown under the name “Scotch Terrier”, until the name was changed to Yorkshire Terrier because of the significant breed improvement having taken place in Yorkshire. Before the breed was well established, any dog in the size and shape of a terrier, with a short tail, and trimmed ears, that had a long blue coat with fawn or silver colored legs and head, was considered to be a Yorkshire Terrier. That is, until the late 1860s, when a popular Paisley type Yorkshire Terrier show dog named Huddersfield Ben, appeared on the dog show scene. This dog, owned by Mary Ann Foster of Yorkshire, was seen in all dog shows throughout Great Britain, and it was this dog who defined the breed type for the dog we now know as the Yorkshire Terrier. According to Ben’s pedigree, he was line bred, which means that he was the product of a mother-son breeding, as was his mother, Lady. Lady was the great-great-granddaughter of Mr. J. Swift’s “Old Crab”, a long coated black and tan terrier born around 1850. It is widely believed that “Old Crab” and “Old Kitty”, who was a Paisley Terrier owned by J. Kershaw of West Yorkshire, are the earliest recorded predecessors of the Yorkshire Terrier breed. Huddersfield Ben was a most accomplished and famous dog who won 74 prizes throughout his show career, making him the type of dog that everybody wanted. Huddersfield Ben competed in Manchester in 1869 where he placed second, and again at Manchester in 1870 where he won first place. At the Crystal Palace dog shows in 1870 and 1871, Ben took first and second prizes. The most famous modern day, UK Yorkshire Terrier was CH Blairsville Royal Seal. Called “Tosha” by his many friends, he was bred, owned and handled by Mr. & Mrs. Brian Lister. Before Tosha died at the age of 15 years, during his show career he was 12 times Best In Show and 16 times Reserve Best In Show, with 33 Group wins, and a Reserve Best in Show at the prestigious Cruft’s. Winning 50 Challenge Certificates and attaining the honor of Top Dog, all breeds, for two consecutive years, Tosha became the sire of many prolific Champions and still features in the pedigree of many of today’s Yorkshire Terriers. The Yorkshire Terrier was a popular pet and frequented many dog shows in England during the Victorian era, and just as Americans were always quick to embrace Victorian customs, they eagerly embraced the Yorkshire Terrier with open arms. Although the first Yorkshire Terrier was introduced to North America in 1872, it wasn’t until 1885 that the first Yorkshire Terrier was registered with the American Kennel Club (AKC). In 1889, the first Yorkshire Terrier to win the title of American Champion was Bradford Harry, who was the great-great-grandson of Huddersfield Ben, and was imported from England by P.H. Coombs of Bangor, Maine. By the 1940’s the breed’s popularity had seen a substantial decline when the percentage of registered small breed dogs dipped to an all-time low of just 18% of total registrations. The breed enjoyed a great resurgence in popularity when Smoky, a Yorkshire Terrier and famous war dog from World War II, was credited with beginning a renewed interest in the breed that has enjoyed continued popularity ever since. In 1984 a piebald Yorkshire Terrier (containing large amounts of white in the coat) was born as a result of a genetic recessive gene occurrence from two Yorkshire Terriers. This rare puppy was born in Germany on January 20, 1984 as a result of a breeding by Gertrud and Werner Biewer’s Yorkshire Terriers. In this particular litter, the piebald puppy’s registered German name was “Schneefloeckchen von Friedheck” (Snowflake). Today these piebald dogs are considered a separate breed, named Biewer or Biewer Yorkie after the owner. The Yorkshire Terrier is now easily recognized throughout the world and there is no doubt that the early Scottish breeders, who were instrumental in producing the feisty toy terrier of today, would surely be astounded at the success this delightful breed continues to enjoy.